Home Aaron Ficnh ACB Accidental Australia Ball Tampering Bradbury Cricket David Warner ECAS India England Interim Ricky Ponting Shane Watson Shaun Marsh Skipper Steve Smith Team Tim Paine Worst ECAS Cricket: Tim Paine - 'The Interim Skipper'? ECAS Cricket: Tim Paine - 'The Interim Skipper'? The current Australian Cricket Team has been witnessed lacking the leadership qualities in all three formats of the game. Since the Maverick players of the team, Steve Smith and David Warner had to resign due to the 'Tactical Ball-Tempering Scandal' and the retirement of the famous duo Micheal Clarke and Brad Haddin respectively after the lost campaign of The Ashes. 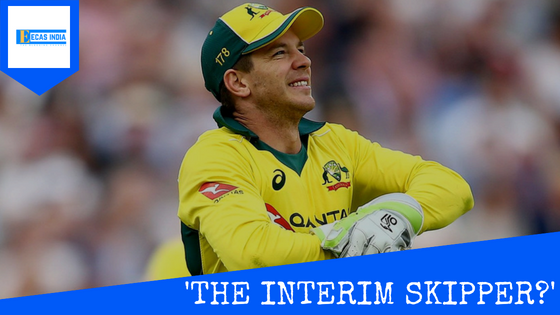 Tim Paine, despite having an underwhelming individual record in the last few years of his professional career, has not even completed a year before his comeback to all the formats of the game, was certainly the right person to lead the side. The step of Australian Cricket Board can be called as declaring 'The Interim Skipper' till they find the best one, who may be the perfect match to lead Australian Cricket Team in all the format of the cricket, as compared to Ricky Ponting. The twitter gags had called Tim Paine 'The Captain of Blunders' after he was criticized for sending Aaron Finch to bat down the order against England Cricket Team. Not only, England played the good but also they set the World Record for highest runs in ODI Cricket (481) under the skipper Tim Paine. The social media has been seen declaring Tim Paine as 'The Accidental Captain' or 'The Worst Captain' in the history of Australian Cricket, but that's not true. The worst choices sometimes are the best than having a no choice. I would happily explain this analysis as when you take a glance at Australian Team in the absence of Smith and Warner, there were few senior players in the team as Marsh, Maxwell, Finch. Tim Paine, who is just senior enough in comparison with all of mentioned, playing all the formats of the Cricket. Shaun Marsh is initially considered as the Test Player and he is the fixed 12th man for the ODI Team, who gets into the side when someone is injured or in the absence of another player. Maxwell and Finch, on the other hand, are limited over format players. The failure of the Maxwell in the Test Matches and Finch being the best one to lead T20 format of the cricket was also not so consistent in the team. Thus, they are not sincerely the captain contenders as any Cricket Board would not make a choice for one format, rather all the formats of the cricket. Thus, making Tim Paine 'The Accidental Captain' or we may call it 'The Good Choice' after all. Tim Paine and Steve Smith started their career together but lack of experience and consistency kept him away from the game for most of the time. With the exclusion of Wade and many others, he has already made his place permanent in the team. During the selection process of Australian Cricket Team, they always had Smith as captain and Warner as Vice Captain, and also they don't worry about other contemporaries as of the Indian Cricket Team who always fills captaincy into everyone. This time we could only wish him better luck or moreover "May Luck be With You".